For concrete mixer, there are three models we always see in the market. Like JZC, JZM and JS. First, JZC, JZM and JS are sign for different kind of mini concrete mixer. JZ series includes JZC and JZM, they all belong to gravity type concrete mixer. Mixing in clockwise and discharging in anticlockwise. While, JZM adopts friction to mix and JZC adopts gear to mix which isgear chain concrete mixer. JS series belongs to twin shafts mixing machine. Mixing in clockwise and discahrging in anticlockwise. This one is mainly used for civil use and the working capacity can not compared with industrial concrete mixer. But this one can mix the plastic and half dry concrete. With perfect performance and convenent to move. JZM belongs to hoisting friction gravity type concrete mixer. This machine adopts rubble roller friction to drive mixer with low noise, stable running and convenient operation. JS concrete mixer belongs to industrial concrete mixing machine, which can mix plastic and half dry concrete and all kinds of sands and small stones. The main difference are direction of twin shaft are opposite and either did leaf blade direction. This series are always use in concrete batching plant to finish the whole working. 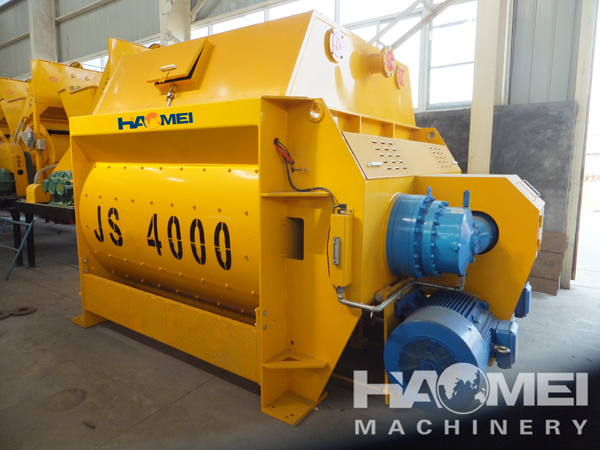 Haomei Machinery Main concrete mixer, concrete mixing station, stabilized soil mixing station, concrete batching machine, concrete conveying equipment, please call to discuss!